Squirrels have bitten to death a stray dog which was barking at them in a Russian park, local media report. 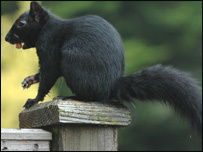 Passers-by were too late to stop the attack by the black squirrels in a village in the far east, which reportedly lasted about a minute. Mikhail Tiyunov, a scientist in the region, said it was the first he had ever heard of such an attack. While squirrels without sources of protein might attack birds' nests, he said, the idea of them chewing a dog to death was "absurd".